The media industry is changing increasingly swiftly, the year 2018 was thus characterized by change at ProSiebenSat.1 as well. The Executive Board and Supervisory Board dealt in depth with the Group structure, the business units and, in association, with their future direction. In doing so, the Executive Board came to the conclusion that a strategic realignment of the Company is required in order to meet the current challenges. The Supervisory Board expressly supports the Group’s new strategy. We are convinced that it forms the basis for further sustainable growth in the Company’s value and the total shareholder return. ProSiebenSat.1’s most important strategic goal is to continue actively shaping the digital transformation and promoting it throughout the Group. We, the Supervisory Board of ProSiebenSat.1 Media SE, provide the Executive Board with comprehensive advice and ongoing support. In financial year 2018, the Supervisory Board again performed the tasks required of it by law, the Company’s Articles of Incorporation, and the rules of procedure, taking into account the recommendations of the German Corporate Governance Code (GCGC) (Deutscher Corporate Governance Kodex — DCGK). In financial year 2018, the Supervisory Board regularly advised the Executive Board on its management of the Company in a spirit of close and trusting cooperation, and diligently and continuously oversaw the Board in conducting the Company’s business. Our work included a detailed examination of the Group’s operating and strategic performance. The Supervisory Board received regular, prompt, and comprehensive information from the Executive Board regarding all issues relevant to the Company’s strategy, planning, business performance, risk situation, risk management, and compliance, both at the Supervisory Board meetings and outside of meetings. The Executive Board explained to the Supervisory Board all deviations from the projected figures in detail and consulted with the Supervisory Board in that regard. We were therefore directly involved in all decisions of fundamental importance to the Company at an early stage. The Supervisory Board meetings were characterized by an open, in-depth exchange between the Supervisory and Executive Boards. Closed sessions, in which the members of the Supervisory Board meet without the Executive Board being present, are also an integral part of the meetings. Wherever specific actions required the consent of the Supervisory Board or one of its committees pursuant to the law, the Articles of Incorporation, or the rules of procedure, we consulted on the matter and adopted the requisite resolution. We were kept consistently and comprehensively informed of all matters requiring our approval, and the associated draft resolutions were promptly submitted for review by the Executive Board. The Supervisory Board was supported in this process by the competent Board committees, and it also discussed the proposals with the Executive Board. In addition to the Supervisory Board meetings, the Executive Board kept us updated on the Company’s key financial indicators in written monthly reports and also provided us with both financial information set up during the financial year and annual financial information and reports. Information on events of significance was provided without delay also outside of meetings and the regular reporting process and, where necessary, we were asked to adopt resolutions by circular vote in consultation with me as the Chairman of the Supervisory Board. In addition, I maintained an ongoing and close one-on-one dialog with the Company’s CEO and, where necessary, also with the other Executive Board members. Based on the reports submitted by the Executive Board, the Supervisory Board stayed up to date on the Company’s situation at all times, was directly involved in upcoming decisions at an early stage, and was therefore able to perform its tasks in their entirety. There was hence no need for the Supervisory Board to examine the Company’s books and other records beyond the documentation provided to us in the course of the Executive Board’s reporting activities. In financial year 2018, the Supervisory Board dealt with the Company’s business and financial situation, fundamental questions of corporate policy and strategy, the general personnel situation, and specific investment projects. ProSiebenSat.1 set the course for the further digital transformation of the entire Group in 2018. An important step was the realignment of the Group on the basis of a three-pillar strategy, including the fusion of the linear TV business with the Digital Entertainment segment. At the same time, the Group reinforced its digital production expertise by integrating Studio71 into the Content Production & Global Sales segment. The third segment comprises the Commerce portfolio with the core brands of NuCom Group, namely Verivox, Parship Elite Group, Jochen Schweizer mydays, and Flaconi. The Group will continue to expand its portfolio through M&A measures here. However, ProSiebenSat.1 is also now focusing more sharply on business areas with organic growth potential such as local content, digital platforms, improved monetization of reach and the establishment of in-house technologies, especially with regard to data and marketing. The Group is thus laying the foundation for further growth and creating added value for employees and shareholders. In addition, the strategic realignment also includes the adjustment of the dividend policy and the share buyback program adopted in this context. The ProSiebenSat.1 management team orchestrated all areas of the strategic realignment with the Supervisory Board, especially at the strategy meeting on September 11, 2018. In addition, the Supervisory Board dealt intensively in 2018 with succession planning for the longstanding Chairman of the Executive Board Thomas Ebeling. In Max Conze, we have found a CEO for ProSiebenSat.1 with effect from June 1, 2018, who has extensive international management experience in different sectors. Conrad Albert temporarily assumed the position of CEO until Max Conze took office and thus ensured continuity for the company. All in all, the Supervisory Board of ProSiebenSat.1 Media SE held five regular, in-person meetings, eight extraordinary teleconferences, and one full-day session in 2018. For a few exceptions, all members of the Supervisory Board attended all meetings. An individual breakdown of meeting attendance is presented in the Corporate Governance Report, which can be found online at www.prosiebensat1.de/en/investor-relations/corporate-governance/corporate-governance-report and in the Annual Report. At an extraordinary meeting held by teleconference on February 11, 2018, the Executive Board informed us of General Atlantic’s planned investment in NuCom Group of 25.1%. We were given a comprehensive insight into the strategic significance of the transaction, the further steps planned and the intended timetable. The Supervisory Board approved the transaction at a second extraordinary meeting on February 21, 2018. With General Atlantic as a partner, ProSiebenSat.1 is laying the foundation for further growth of NuCom Group and the expansion of the enterprise into a leading commerce provider in Europe. In a first joint transaction, NuCom Group acquired shares in Verivox and Parship Elite Group held by Oakley Capital and other investors, which increased its shareholdings to nearly 100% and around 94% respectively. In addition, NuCom Group acquired the remaining minority shares in SilverTours GmbH (billiger-mietwagen.de) and now owns 100% of the company. With these joint acquisitions, ProSiebenSat.1 and General Atlantic are showing the strategic direction for the years to come: Ownership and control structures are to be simplified and the earnings base consolidated. At the financial statements meeting held on March 12, 2018, the Supervisory Board approved the Annual and Consolidated Financial Statements, the Combined Management and Group Management Report, and the Corporate Governance Report for financial year 2017 as well as the 2017 Declaration of Compliance. The Board reviewed and concurred with the proposal of the Executive Board for the allocation of profits. This also applies to the Audit and Finance Committee’s proposal for the appointment of the auditor for financial year 2018. We also approved the agenda for the Annual General Meeting on May 16, 2018, with the corresponding proposed resolutions. The Supervisory Board followed the recommendations of the Compensation Committee and approved topics relating to Executive Board remuneration, i.e. payment of a performance bonus for financial year 2017 as well as settlement of the 2014 Group Share Plan and the amounts of the related cash disbursements. The implementation of a new compensation system for members of the Executive Board was unanimously approved. We also extensively discussed and approved the individual targets for the Executive Board members for the financial year. In addition, it was announced that the Presiding and Nominating Committee dealt with potential succession planning for the Supervisory Board member Antoinette P. Aris at its meeting on March 9, 2018. At the financial statements meeting, we were moreover supplied with a detailed overview of the Company’s current performance and were informed about possible M&A transactions. At an extraordinary meeting on March 23, 2018, the Supervisory Board resolved to nominate Ms. Marjorie Kaplan as successor to the departing Supervisory Board member Antoinette P. Aris for election at the Annual General Meeting in May 2018. The meeting was held by teleconference. Max Conze introduced himself to the shareholders as the new Chairman of the Executive Board at the Annual General Meeting on May 16, 2018. Another regular Supervisory Board meeting was held after the Annual General Meeting. This was also the first meeting attended by the new Supervisory Board member Marjorie Kaplan, who took over Antoinette P. Aris’ seat on the Supervisory Board effective May 16, 2018. Antoinette P. Aris was replaced in the respective committees by Angelika Gifford (Audit and Finance Committee) and Prof. Dr. Rolf Nonnenmacher (Compensation Committee). At this meeting, we were thoroughly informed about the development in the individual business areas and possible M&A transactions. These included the potential partnership with Discovery Communications with the aim of establishing a shared local streaming platform for Germany. Another topic at this Supervisory Board meeting was the planned implementation of the new EU General Data Protection Regulation, which came into force on May 25, 2018. Furthermore, we were given an insight into the processes for budget planning in 2019 and the long-term strategy plan for 2019 – 2023. In this meeting I also informed the Board that I had spoken with Mr. Christof Wahl about the need to discontinue the responsibilities of his Executive Board position arising from the pending reorganization of the Entertainment segment in connection with the three-pillar strategy and about an early termination of his employment contract. The Supervisory Board then authorized me to conduct further talks with Christof Wahl. The Company’s annual strategy meeting was held on June 20, 2018. Here, Max Conze told us about his first impressions since taking office as CEO of ProSiebenSat.1 Media SE and the Group’s planned strategic development. The objective is to continue the growth in a sustainable manner while increasingly focusing on important investment areas such as the maximization of reach and attractive programming. In this context, the status and the further development of the joint venture with Discovery Communications regarding the online-streaming and catch-up platform “7TV” were also discussed again. Together with Discovery, ProSiebenSat.1 is expanding 7TV into a central and cross-provider streaming platform in the German market. The Group is thus responding to altered media usage interests. On July 21, 2018, an extraordinary meeting was held by teleconference. At this meeting, we were informed about the Group’s financial performance in the third quarter of 2018 and the associated capital market communication. At a regular Supervisory Board meeting on September 11 and 12, 2018, the Executive Board informed us about the planned update to the allocation of responsibilities in the rules of procedure. This update ensures that the three-pillar strategy is rigorously reflected in the rules of procedure and in the operating and managerial responsibilities within the Company. We were also informed about potential upcoming M&A transactions, such as a potential acquisition of the online matchmaking site eharmony. At this meeting, the Supervisory Board, having regard to the recommendation of the Audit and Finance Committee, decided to propose the audit firm Ernst & Young to the next Annual General Meeting on June 12, 2019, for election as the statutory auditor for financial year 2019; the Audit and Finance Committee’s recommendation and the Supervisory Board’s decision constituted an appropriate selection procedure in accordance with Art. 16 of Regulation (EU) No. 537/2014 on specific requirements regarding statutory audit of public-interest entities (statutory auditor regulation). In addition, we approved the appointment of Conrad Albert, Deputy CEO of ProSiebenSat.1 Media SE, as a member of the Supervisory Board at Orange Ocean UG. The non-profit organization Orange Ocean campaigns for the protection of the world’s oceans. Another teleconference on October 31, 2018, was devoted to preparations for Capital Markets Day on November 14, 2018, and the evaluation of the current business situation. The Executive Board provided us with extensive information on the Company’s financial performance. At an extraordinary Supervisory Board meeting held by teleconference on November 7, 2018, we were informed about the successful conclusion of the contract negotiations with the American film and television company Warner Bros. Entertainment and granted our approval. We also approved a share buyback program with a total volume of up to EUR 250 million and a total term of 12 to 24 months on the recommendation of the Audit and Finance Committee. At the current valuation level, the Group uses share buybacks as an instrument to improve its capital efficiency. The Supervisory Board also dealt with an adjustment of the dividend policy, which it also approved at the recommendation of the Audit and Finance Committee. Finally, the Supervisory Board agreed that the contract of Jan David Frouman, Chairman & CEO of Red Arrow Studios and Executive Board member of ProSiebenSat.1 Media SE, which has a term until February 28, 2019, will not be extended. Jan David Frouman has worked for the Company in various roles since 2004. He established Red Arrow Studios from 2010 and was a member of the Executive Board of ProSiebenSat.1 Media SE from March 1, 2016. Following the meeting on November 7, 2018, the Group informed the capital market of the adjustment of the financial outlook for full-year 2018 and the results of the strategy update. In addition to the announcement of the above-mentioned share buyback program, this included the adjustment of the dividend policy. At the same time, ProSiebenSat.1 will invest additionally in local content, the expansion of digital platforms and an improved monetization of reach from 2019 for a modern and even more relevant entertainment business in the future. An important component is the enhancement of the joint venture 7TV as an alternative to the offers of the global Internet corporations and the many compartmentalized in-house distributors of local competitors. At the regular Supervisory Board meeting on December 6, 2018, the provisional budget for 2019 and the provisional long-term strategy plan for 2019 – 2023 for ProSiebenSat.1 Group were presented to us. We were also informed in full detail about the economic performance of the key business areas. In addition, we were given a comprehensive insight into the business area and the business performance of the investments Studio71, BuzzBird and Amorelie. The other agenda items at this meeting were planned M&A transactions and a review of Capital Markets Day on November 14, 2018. Another extraordinary Supervisory Board meeting was held by teleconference at the beginning of the new financial year on February 18, 2019. The meeting dealt with the enhancement of the Executive Board and holding structure with the aim of speeding up the transformation process. The Group’s Executive Board is to be streamlined to three core tasks — the CEO role, the Finance department (CFO) and the function of Group General Counsel & Deputy CEO (Executive Committee). In parallel, the Company will establish a new Executive Board on holding level from April 2019, on which the CEO, CFO and Deputy CEO/Group General Counsel will sit as well as the respective Co-CEOs, who lead the subordinate pillars — Entertainment, Red Arrow Studios and NuCom Group. The transfer of operational decision-making processes to the individual pillars will make the Group much more agile and effective in the future. Sabine Eckhardt and Dr. Jan Kemper are leaving the ProSiebenSat.1 Executive Board by mutual consent. The Supervisory Board consented to this in this meeting. In addition, the Supervisory Board — after extensive discussion at the regular Supervisory Board meetings — adopted seven resolutions by way of written circular vote in 2018, including on the following topics: In May, the Supervisory Board approved the appointment of Conrad Albert as a member of the Supervisory Board of Bavaria Studios & Production Services GmbH. In June, the Supervisory Board approved the termination of Christof Wahl’s employment contract as a member on the Executive Board of ProSiebenSat.1 Media SE. In August, the Supervisory Board followed the recommendation of the Compensation Committee and approved the terms and conditions of the new Performance Share Plan and the performance targets for the members of the Executive Board for financial year 2018. In October, the Board granted its approval for the 100% acquisition of the online matchmaking service eharmony by Parship Elite Group. The Supervisory Board of the Company has formed various committees to support it in its work. In 2018, the Board had four committees to ensure efficient execution of its duties: The Presiding and Nominating Committee, the Compensation Committee, the Audit and Finance Committee, and the Capital Markets Committee. The committees reported to the Supervisory Board regularly and comprehensively on their activities in its plenary sessions. The main emphases of the committees’ work are described below. An individual breakdown of attendance at meetings of the Supervisory Board’s committees is provided in the Corporate Governance Report, which can be found on our website at www.prosiebensat1.de/en/investor-relations/corporate-governance/corporate-governance-report as well as in the Annual Report. The Presiding and Nominating Committee met five times by teleconference in 2018. It passed a total of two resolutions by way of circular vote. This committee coordinates the work of the Supervisory Board and prepares its meetings. In addition, it is responsible for the tasks of a nominating committee in accordance with the German Corporate Governance Code and adopts resolutions that have been delegated to it under the Supervisory Board’s rules of procedure. This includes examining license agreements, distribution agreements, and marketing agreements. In 2018, one of the priorities of the discussions in the Presiding and Nominating Committee was the succession of the Supervisory Board member Antoinette P. Aris. Antoinette P. Aris had been a member of the Supervisory Board of ProSiebenSat.1 Media SE since June 26, 2014, and left the Board at her own request with effect as of the end of the Annual General Meeting on May 16, 2018. The succession was first discussed at an extraordinary meeting by teleconference on March 9, 2018; the topic was also the subject of an extraordinary meeting on March 14, 2018, and another extraordinary meeting on March 16, 2018. At an extraordinary meeting on March 20, 2018, all members of the committee voted for the candidate Marjorie Kaplan to succeed the member of the Supervisory Board Antoinette P. Aris. The Compensation Committee prepares resolutions on personnel-related Executive Board matters for plenary sessions of the Supervisory Board. This committee held one meeting in person and six meetings by teleconference in 2018. At an initial meeting on January 11, 2018, the committee addressed the implementation of a new compensation system for the members of the Executive Board; another meeting on January 16, 2018, dealt with the Executive Board members’ target achievement under the 2014 Group Share Plan. At the meeting on January 23, 2018, the Executive Board members’ individual degrees of target achievement for the 2017 performance bonus were presented and approved. The new compensation system for the members of the Executive Board was discussed again at another meeting, which was held by teleconference on February 2, 2018. At an extraordinary meeting on February 28, 2018, the committee also dealt in detail with the performance bonus targets for the individual Board members for financial year 2018 and agreed on a corresponding recommendation to the full Supervisory Board. The meeting on June 8, 2018, addressed the adjustment of the Executive Board contracts in connection with the new compensation system and the definition of the degree of target achievement in the Mid-Term Incentive Plan. Another resolution was also adopted by circular vote: In July 2018, the committee approved the final terms and conditions of the new Performance Share Plan and the 2018 performance bonus targets for each Executive Board member. The Audit and Finance Committee held five meetings in the period under review, which were also attended by the CFO and the auditor. It reviewed the Annual Financial Statements and the Consolidated Financial Statements, the Combined Management Report, and the proposal for the allocation of profits in preparation for the Supervisory Board, discussing the audit report and the auditor’s verbal report on the main findings of the audit in particular depth. The Audit and Finance Committee did not find any grounds for objections in its reviews. In addition, the Audit and Finance Committee discussed the quarterly statements and the Half-Yearly Financial Report with the Executive Board prior to their publication, taking account of the auditor’s report on the audit review. It is also the Audit and Finance Committee’s task to prepare the Supervisory Board’s review of the Company’s non-financial reporting. In the period under review, monitoring of the financial reporting focused on the potential impairment of goodwill and other intangible assets, the measurement of programming assets, accounting for acquisitions of companies and shareholdings, revenue recognition, hedge accounting, accounting for financial liabilities, and income taxes. The Audit and Finance Committee monitored the accounting process and the effectiveness of the internal control system and the risk management system, also referring to the corresponding reports by the head of Internal Audit and the auditor. No significant weaknesses in the internal control system for the accounting process or in the early risk detection system were identified by the auditor. In addition, the Audit and Finance Committee handled the preparation of the Supervisory Board’s proposal for the appointment of the auditor for financial year 2018 by the Annual General Meeting, the engagement of the auditor, and the fee agreement with the auditor. It monitored the effectiveness of the audit of the financial statements and the independence of the auditor, as well as the services performed by the auditor in addition to auditing services. The Audit and Finance Committee was involved in the selection procedure in accordance with Art. 16 of Regulation (EU) No. 537/2014 (statutory auditor regulation) with regard to the appointment of the auditor for financial year 2019 and, as a result of the selection procedure, submitted an appropriate recommendation of candidates, including a preference for the audit firm Ernst & Young, to the Supervisory Board. The Audit and Finance Committee continuously engaged in dialog with the auditor regarding the main audit risks and the required focus of the audit of the financial statements. It established an internal regulation on services by the auditor that are not related to the audit of the financial statements (“non-audit services”) and ensured that the auditor and the Executive Board informed it at each meeting about corresponding contracts and the fees incurred in this context, which it approved. In addition, the Audit and Finance Committee was regularly informed about the further development of the compliance management system, the handling of suspected compliance incidents, legal and regulatory risks, and the risk situation, risk identification, and risk monitoring at the Company. There were also regular reports on the risk assessment by the Internal Audit department, its resources, and audit planning. The Executive Board regularly informed the Audit and Finance Committee of the status of various activities to finance and secure liquidity for the Company. This was partly done at another meeting in person in December. The heads of the responsible departments also attended the Audit and Finance Committee’s meetings for selected items of the agenda, providing reports and answering questions. In addition, the chairman of the Audit and Finance Committee held discussions on important individual topics between the meetings, particularly with the chairman of the Supervisory Board, the Chief Financial Officer, and the auditor. The main results of these discussions were regularly reported to the Audit and Finance Committee, as well as to the Supervisory Board where necessary. The Capital Markets Committee is authorized to decide in lieu of the full Supervisory Board on whether to approve the use of the Company’s Authorized Capital as well as on the associated measures. In financial year 2018, a Capital Markets Committee meeting was held on July 15, 2018. Besides capital market communication, this meeting dealt with ideas regarding a possible share buyback program and a potential adjustment of dividend policy. The agenda also included possible M&A transactions in the second quarter of the financial year. The Annual and Consolidated Financial Statements of ProSiebenSat.1 Media SE and the Combined Management Report for financial year 2018 were audited by the Munich office of KPMG AG Wirtschaftsprüfungsgesellschaft (KPMG) in accordance with generally accepted accounting principles and were issued an unqualified audit report on February 25, 2019. All documents relating to the financial statements, the Risk Report, and the KPMG audit reports were made available to the members of the Supervisory Board in due time and were subjected to a thorough review by us. Another subject of the discussions was the Non-Financial Group Statement in accordance with Sections 289c and 315c(1) HGB. The documents were discussed in detail in the presence of the auditors, first at a meeting of the Audit and Finance Committee and then at a meeting of the Supervisory Board. At those meetings, the auditor reported on its significant audit findings. No accounting-related deficiencies were identified in either the internal control system or the risk management system, nor did any circumstances arise that could give cause for concern about the independence of the auditors. In addition to auditing services, the auditors performed other attestation services amounting to EUR 0.4 million (previous year: EUR 0.5 million), tax advisory services amounting to EUR 0.0 million (previous year: EUR 0.1 million), and other services amounting to EUR 0.1 million (previous year: EUR 0.3 million). Details of the services provided by the auditors and the amounts remunerated are presented in Note 35 of the Notes to the Consolidated Financial Statements. The Supervisory Board acknowledged and approved the auditor’s findings and, after completing its own examination, found no cause for objection on its part either. The Supervisory Board also approved the Annual and Consolidated Financial Statements prepared by the Executive Board and audited by the auditor as well as the Combined Management Report. The Annual Financial Statements are thus adopted. Finally, the Supervisory Board reviewed and concurred with the Executive Board’s proposal for the allocation of profits. In accordance with Section 111(2) Sentence 4 of the German Stock Corporation Act (Aktiengesetz — AktG), the Supervisory Board commissioned an external review of the content of the Combined Non-Financial Statement from KPMG. KPMG issued an unqualified audit opinion in this regard. This means that, according to the assessment by KPMG, the Combined Non-Financial Statement of ProSiebenSat.1 Media SE was prepared in compliance with Sections 315b and 315c in conjunction with Sections 289b to 289e HGB in all material respects. In its review, which was also based on the Audit and Finance Committee’s report on its preparatory review and its recommendation, and the review of KPMG’s report and its audit opinion, the Supervisory Board likewise did not identify any reasons to doubt the correctness and appropriateness of the Non-Financial Group Statement. Antoinette (Annet) P. Aris is on the Supervisory Board of Thomas Cook PLC. As a precautionary measure, she therefore absented herself from the Company’s Supervisory Board meetings before any discussion of the travel portfolio took place. She rejoined the meetings only after the discussions had been completed or the relevant resolutions adopted. Angelika Gifford has been on the Supervisory Board of TUI AG since February 2016. She likewise absented herself from the meetings of the ProSiebenSat.1 Media SE Supervisory Board as a precautionary measure before any discussion of the travel portfolio took place and rejoined the meetings only after the discussions had been completed or the relevant resolutions adopted. Otherwise, there were no indications of any conflicts of interest. The Executive Board and the Supervisory Board have compiled a separate report on corporate governance. The Corporate Governance Report and the Management Declaration pursuant to Sections 289f and 315d of the German Commercial Code can be found on our website at www.prosiebensat1.com and in the Annual Report. On February 21, 2018, we appointed Max Conze as the new Chairman of the Executive Board of ProSiebenSat.1 Media SE. He took over from Thomas Ebeling as of June 1, 2018. Max Conze was most recently Chief Executive Officer at Dyson. With his innovativeness and marketing expertise, he expanded the company into a dynamically growing global technology group. The longstanding Chairman of the Executive Board of ProSiebenSat.1 Media SE, Thomas Ebeling, left the Company with effect from the end of February 22, 2018. Thomas Ebeling had a contract lasting until mid-2019. When his contract was last extended, however, he already stated that he would no longer be available for another extension afterwards. Conrad Albert, who has been at the Company since 2005 and is Deputy CEO of ProSiebenSat.1 Media SE and the Company’s General Counsel, was appointed as Deputy chairman of the Executive Board with immediate effect as of November 19, 2017, and assumed the position of CEO until Max Conze took office. Christof Wahl, Chief Operating Officer Entertainment of ProSiebenSat.1 Media SE, left the Group by mutual agreement on July 31, 2018. Following the pooling of the Entertainment portfolio activities in a single segment, Christof Wahl’s areas of responsibility relating to digital entertainment were bundled in this segment in order to achieve closer cooperation between traditional and digital offerings. 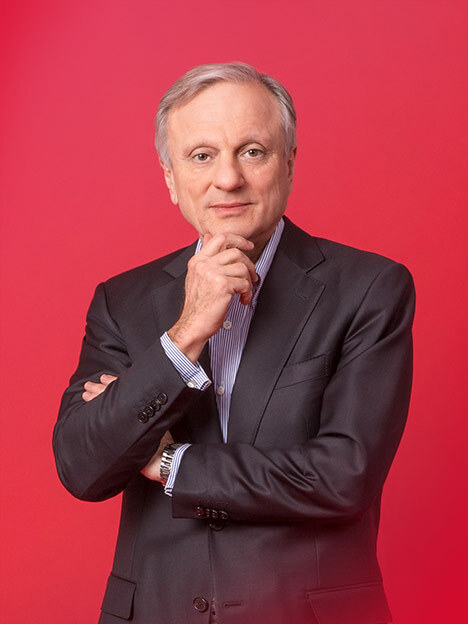 In addition, Jan David Frouman, Chairman & CEO Red Arrow Studios and member of the Executive Board of ProSiebenSat.1 Media SE, left the Company at the end of his contract on February 28, 2019. He established Red Arrow Studios from 2010 and was a member of the Executive Board of ProSiebenSat.1 Media SE from March 1, 2016. In February 2019, the Group announced further changes to the Executive Board and established a new management structure: After 15 years, Sabine Eckhardt, Executive Board Member Sales & Marketing, has decided to leave ProSiebenSat.1 Group by mutual consent as of April 30, 2019. Michaela Tod will take over Sabine Eckhardt’s responsibilities from April 2019. She will manage the new Entertainment pillar as Co-CEO Entertainment together with Wolfgang Link. After nearly two years as CFO, Dr. Jan Kemper is also leaving the Executive Board by mutual consent as of March 31, 2019. His successor Rainer Beaujean, currently CFO of the listed packaging manufacturer Gerresheimer AG, will take office as ProSiebenSat.1 CFO on July 1, 2019. During the transition period, Ralf Peter Gierig, the long-standing Deputy CFO of ProSiebenSat.1 Group, will take over as interim CFO reporting to Max Conze. In the future, the Group will be managed by an Executive Committee comprising the CEO, CFO and Deputy CEO/Group General Counsel. At the same time, the Company will introduce a new Executive Board at holding level as of April 1, 2019, on which the two co-CEOs of the respective segments will also be represented. This new holding structure is the logical continuation of the three-pillar strategy: More independence and autonomy in operational business will help ProSiebenSat.1 to transform its business model. Antoinette P. Aris, member of the Supervisory Board and of the Compensation and Audit and Finance Committees, left the Supervisory Board of ProSiebenSat.1 Media SE with effect from the end of the Annual General Meeting on May 16, 2018. She was succeeded at the end of the Annual General Meeting on May 16, 2018, by Marjorie Kaplan. Ms. Kaplan, who lives in London, is a self-employed entrepreneur and member of the Supervisory Board of The Grierson Trust. On behalf of the Supervisory Board, I would like to wholeheartedly thank the members of the Executive Board. I would expressly like to thank Conrad Albert on behalf of the entire Supervisory Board; he managed the Company as CEO until the summer of 2018 and massively advanced the implementation of the three-pillar strategy during that time. He proved himself as a very distinctive and experienced businessman in the German media industry. I also sincerely thank Antoinette P. Aris. She was a member of the Supervisory Board from June 2014 to May 2018 and crucially supported our committee work with her expertise and engagement. I would also like to take this opportunity to especially thank all employees for their great commitment in financial year 2018. Their work forms the cornerstone for the success of ProSiebenSat.1 Group. In conclusion, I would like to convey my thanks to you, our esteemed shareholders, for your confidence in the Company and in the company stock of ProSiebenSat.1. 2018 was a challenging year, but the course has been set for growth. Shows an economic hedge relationship in line with IAS 39. Here what are opposing value changes of the hedged underlying transactions and the derivative financial instruments are recognised in the income statement in accordance with their economic substance.